Last Friday I reached the summit of another metaphorical mountain. After seven months of intensive scribbling (bar a couple of short holidays and a spot of paid work) I finished the first draft of my next major book. The book describes my journey through Ecuador, culminating in our unique ascent of Chimborazo from sea to summit last year. 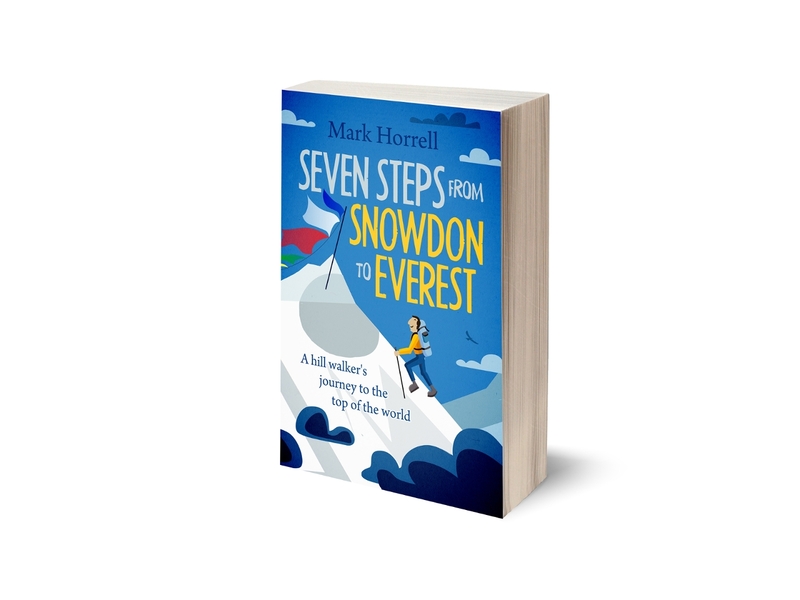 It will be a follow up, and my first full-length book since I published Seven Steps from Snowdon to Everest in 2015. Cheers! A wee glass of prosecco to celebrate finishing the first draft. I look quite pleased. 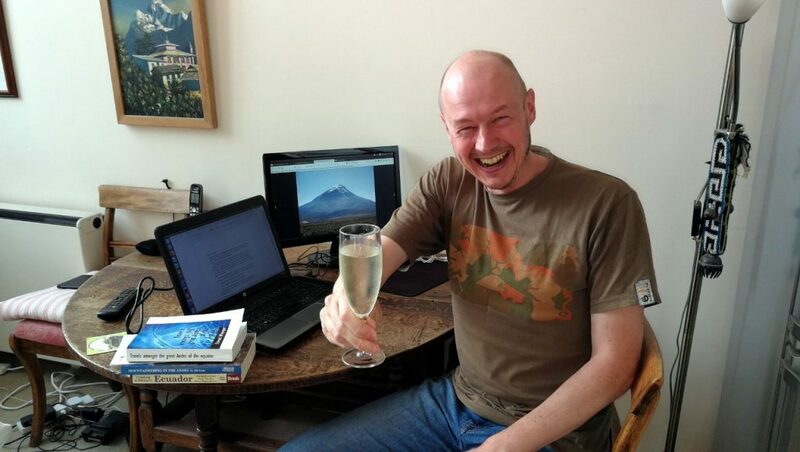 Like Seven Steps, the new book (working title Chimborazo) describes several adventures in the course of pursuing a dream, and includes plenty of historical background about early exploration and ascents. The history of exploration in Ecuador is a colourful one. Ever since the Spanish conquest in the 16th century, its volcanoes and geographical position on the Equator have fascinated explorers. The journeys of Charles-Marie de La Condamine, Alexander von Humboldt and Edward Whymper are covered in detail, along with those of many others. But the book is principally about my personal journeys through the mountains. It’s intended to be both serious and humorous and, like with Seven Steps, I’ve worked hard on the jokes (well, OK, maybe not that hard). There’s still a little way to go before the book is ready for publication. The first draft stands at 140,000 words, and my next job is to cut out the rubbish, ideally chopping it down by a third before handing it to my editor Alex Roddie for a structural edit. There will be a further draft based on Alex’s feedback, and another one after input from beta readers, who have kindly agreed to read an early draft and provide feedback. So don’t hold your breath, but the book will hopefully be available early next year. To whet your appetite, here’s a short extract from the first draft. It’s one of the historical passages, providing a short climbing history of Cotopaxi, arguably Ecuador’s best-loved volcano. Bear in mind this is an early draft. The extract below may or may not make it into the final book. If it does then it’s likely to be substantially edited. I very much hope you enjoy it and I welcome any feedback. 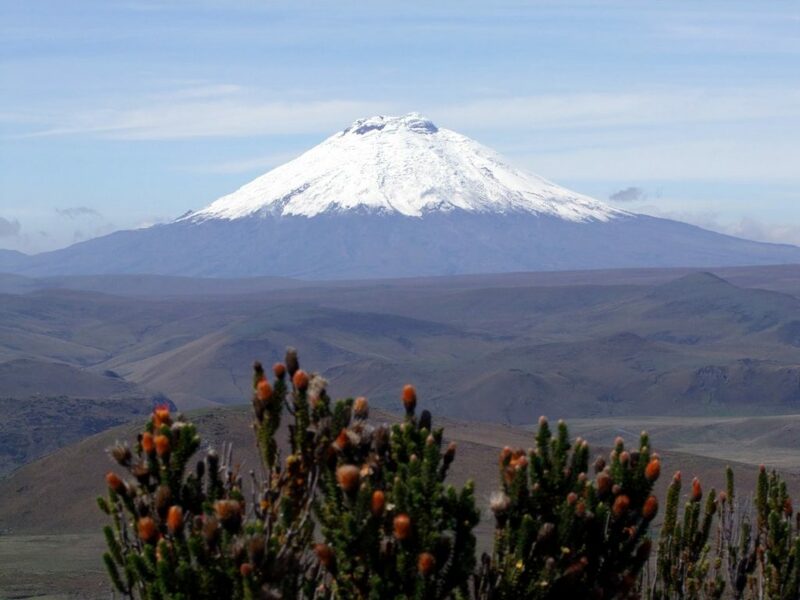 Charles-Marie de La Condamine had wanted to climb Cotopaxi during the French Geodesic Mission in 1738, but he couldn’t find anyone to go with him. He had to content himself with surveying from its lower slopes and stumbling across the plateau in thick mist with Pierre Bouguer. One of the first to have a go at reaching the summit was the German scientist Alexander von Humboldt in 1802. He didn’t get much higher than 4,400m, which is lower than Cotopaxi’s car park is today. 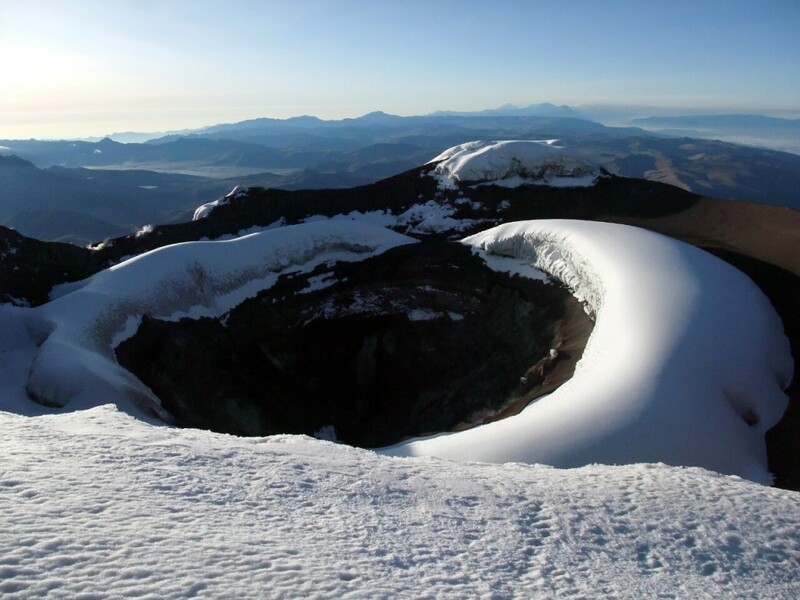 Humboldt said it was ‘extremely difficult’ to reach the lower edge of the snowline, and he asserted ‘with some degree of certainty’ that it would be impossible to reach the edge of the crater. Humboldt was a clever chap who got many things right. He was one of the first people to group plants by their climate zone and surrounding environment, rather than by their shape and characteristics. He invented isotherms, and discovered that the Orinoco and Amazon rivers were connected. He was one of the first people to observe and document man-made climate change, a concept some people have difficulty grasping even today. But on climbing Cotopaxi I can say with an even greater degree of certainty than he can, that this is one of the things he got very wrong. A better effort at getting up it was made by Jean-Baptiste Boussingault and Colonel Hall in 1831, whom we last encountered suffering from snow blindness after their attempt on Antisana. They learned from this experience, and set out for Cotopaxi with masks to protect their face and eyes. They approached from the west side, and after four hours of climbing, claimed to have reached an altitude of around 5,600m according to Boussingault’s barometer. At this point the snow became much softer, and they felt that it was too much of an avalanche risk. They could smell sulphur fumes and ‘regretted our inability to look into the mighty laboratory of nature now so near us’ as Hall poetically described it (he was one of the first explorers to think of Cotopaxi as a giant Bunsen burner). 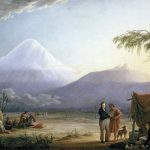 If you’ve been following the climbing history of Ecuador’s volcanoes so far, you’re probably expecting me to say that Cotopaxi was finally climbed for the first time by Edward Whymper, and Jean-Antoine and Louis Carrel in 1880. 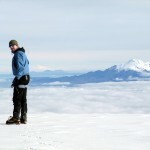 They made the first ascent of pretty much every other volcano in Ecuador, after all, so why not Cotopaxi? Well in that case, I’m going to surprise you. Those three men did do something rather special on Cotopaxi, but it wasn’t that. Inspired by Humboldt, two German geologists Wilhelm Reiss and Alphons Moritz Stübel, travelled to Ecuador in 1868 with the explicit intention of studying its volcanoes. If I had my time again (and I was a bit cleverer) then I would probably try to become a vulcanologist or a glaciologist, two branches of science where you have a pretty good excuse to climb a mountain for work purposes. Of these two, being a vulcanologist probably has the edge, because not only do you have a good excuse to climb some way up the side of a mountain, but you’re actually compelled to reach the summit so that you can look down into it and study the crater. Reiss and Stübel had already climbed Corazón in 1870. During his observations of other mountains, Reiss had taken the opportunity to study Cotopaxi from all angles for possible lines of ascent. By 1872 he had been in Ecuador four years and observed how the snow came and went in cycles. There was a point on the south-west side where he had noticed the black lines of old lava flows creeping up above the ice. Sometimes they disappeared under snow, but they eventually reappeared again after a dry spell. He hoped these narrow black trails would provide him with a possible route to the summit. He bided his time, and after a period of dry, hot weather in November 1872, he saw the trails reappear. He decided to make his move. Reiss made his ascent on 28 November with his Colombian butler Angel Escobar. Famous Colombian Escobars include the drug lord Pablo Escobar and footballer Andres Escobar, who was heinously murdered after conceding an own goal that knocked his team out of the 1994 World Cup. In my humble opinion, Angel Escobar deserves to be just as well known as these two. Not only was he the first Colombian to make a first ascent of an Ecuadorian volcano, but almost certainly the first butler to make a first ascent anywhere in the world. They crossed a lava field that had been left behind by an eruption in 1854. It was five years before the devastating eruption of 1877, and they could see fumaroles (small wisps of volcanic gas) rising out of the vertical cliffs above them that formed the outer walls of Cotopaxi’s crater. Reiss was well acclimatised after the years he had spent in Ecuador’s volcanic highlands, and he even felt well enough to smoke a cigar whilst climbing. But as they climbed higher and had to take more frequent rests, he decided it would be a wise move to stub it out. In some ways then, he was the forerunner of the legendary British climber Don Whillans, who completed many expeditions to the Himalayas in the 1970s. 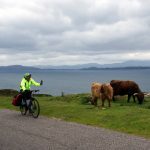 Perhaps, even more than his climbing ability, Whillans was known for having a sizeable beer gut and penchant for cigarettes. There are many stories of him puffing away at extreme altitudes, and treating his climbing partners to a fug of smoke in their tent. Anyway, this was a hundred years away. As Reiss climbed higher on Cotopaxi, his route alternated between icy snowfields and loose volcanic sand. He had started the climb with thirteen porters, but when he stopped for a rest at 5,700m, only his dog and butler were still following. The dog was howling in pain, but didn’t want to leave its master. They ascended into the clouds and thought there was still a long way to go as cliffs rose above them, but very suddenly they arrived on the summit and found themselves staring down into the crater. Reiss noted that the crater was elliptical, and he estimated it to be 500m deep. Dense white clouds of volcanic gas were rising out of it, but he was scientist, which meant he couldn’t just take a couple of summit photos and head back down again. He had to do something silly while he was up there. He sat side-saddle on the rim of the crater, investigating the deposits from the fumaroles, while Escobar held his hand to stop him falling down into its bowels. There was a sudden gust of wind that blew sand impregnated with sulphuric acid into his eyes. His eyes immediately became inflamed and he was virtually blinded. He could perform no more observations, and the only thing on his mind was to descend as quickly as possible. Their situation wasn’t improved by a snowstorm on the way down, but luckily their porters were still waiting for them and assisted them back to camp. The following year, Stübel repeated Reiss and Escobar’s (and the dog’s) ascent of Cotopaxi by the same route. This time, he was accompanied by four Ecuadorians – Rafael Jantui, Melchor Páez, Vicente Ramón and Eusebio Rodriguez – who thus became the first Ecuadorians to climb a major peak in Ecuador. It seemed there wasn’t much left on Cotopaxi for Whymper and the Carrels to do. That’s all for now. Please let me know what you think, and whether there is anything you would like to see in a book like this. I hope to provide further updates and teasers as the project progresses. It’s all beginning to sound like Eric Newby meets Redmond O’Hanlon. Yay! New book! I will wait patiently. I’m looking forward to read your whole book. It sounds interesting. I was born and raised in Quito, Ecuador, and during my youth, I climbed many of the Ecuadorean peaks. Cotopaxi was always my favorite. If you are interested I’m a freelance proofreader. Contact me if you would like me to proofread your book before it goes to editing and perhaps give you a tip or two. Good extract. Look forward to hearing when the finished article is available to purchase which will hopefully not be too long. Great extract Mark! I spent a wonderful few months in Ecuador in 1999 when I was sadly too young and stupid to realise how fun it was to climb mountains (I have since reformed) but I still remember being captivated by the beauty of Cotopaxi. I hope to return one day and climb it but in the meantime I look forward to armchair travel via your new book! Looking forward to reading the whole book once it is available!